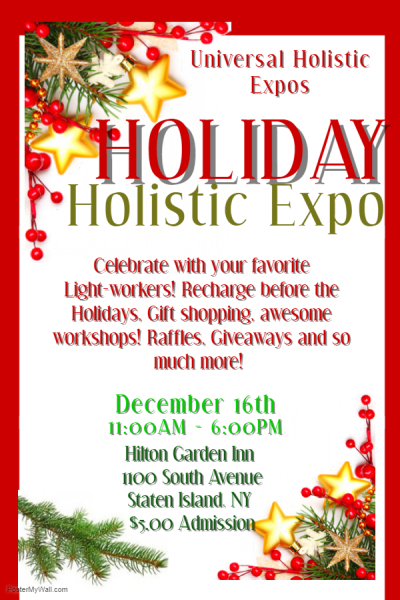 What began as an experiment last year, has quickly become a major collective portal where Holistic practioners across the Tri-State area have come together to showcase and share their brillant light and talents with Staten Island residents and beyond. The Universal Holistic Expos are a premire venue that represents excellence, integrity, reverence for light, energy, healing and service. There have been many venues who have followed our lead to create a portal for others to come and experience and explore spirituality and holistic modalities. Each expo has grown in both presentation and in attendance because people are thristy and open to learning more about Holistic modalities and spirituality. If you are a Holistic practitioner and would like to join us for this or an upcoming Expo, go to the Contact tab and send us a message. We generally hold 3 Expos a year; Spring, Autumn, and a Holiday Expo in December. We have also added advertisement opportunities for non-presenting practitioners to be a part of our Holistic hand-out booklet. To learn more, scroll down.